Our Community Vet Clinic offers preventative care including neutering, microchipping and vaccinations. 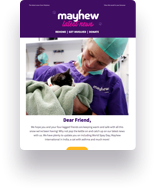 Mayhew’s Community Vet Clinic provides free and low-cost veterinary care for all pet owners and our in-house animals. The services we offer include free and low-cost neutering, vaccinations, microchipping and flea/worming treatment. Our low-cost neutering services are available to everyone. We offer free neutering for bull breeds and cats eligible under the London C4 scheme. Free and low-cost neutering services available to everyone. Vaccinating your pet is essential for protecting them against diseases. Don't let your best friend get lost. Microchipping helps keep you and your pet together. Our nurse clinics offer basic care for your pet from nail clipping to dental checks. Defleaing and deworming are important to keep your pet at optimal health. My pet needs help - what to do in an emergency? Animals attending our Vaccination Clinic can attend for their primary course of vaccinations. After this, we would require them to be neutered to continue attending our Clinic. Neutering appointments are open to everyone without restriction. You can purchase flea and worm treatment from our reception. Please ensure your pet is registered at a private vet or another charity (if you fit their criteria), in case of any other veterinary needs or emergencies. Our Vet Clinic reception is open Monday to Saturday 9am-5pm. Please call to book your low-cost neutering and/or vaccination appointment. If we cannot answer your call, please leave a message and we will get back to you. We are offering lifetime vaccinations for your dog or cat for a one-off payment of £99. Visit our vaccination page or call our reception to find out more about our Booster Bundle offer.